I read this article and found it very interesting, thought it might be something for you. The article is called Economist Debunks Huge Free-Market Myth About Government and is located at http://evonomics.com/economist-debunks-huge-free-market-governments/. In seeking to promote innovation-led growth, it is fundamental to understand the important roles that both the public and private sectors can play. This requires not only understanding the importance of the innovation ‘ecosystem’ but especially what it is that each actor brings to that system. 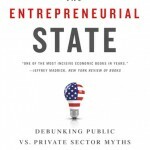 The assumption that the public sector can at best incentivize private sector– led innovation (through subsidies, tax reductions, carbon pricing, technical standards and so on), especially but not only in the face of the recent crisis, fails to account for the many examples in which the leading entrepreneurial force came from the State rather than from the private sector. Ignoring this role has impacted the types of public– private partnerships that are created (potentially parasitic rather than symbiotic), and has wasted money on ineffective incentives(including different types of tax cuts) that could have been spent more effectively. To understand the fundamental role of the State in taking on the risks present in modern capitalism, it is important to recognize the ‘collective’ character of innovation. Different types of firms (large and small), different types of finance and different types of State policies, institutions and departments interact sometimes in unpredictable ways, but surely in ways we can help shape to meet the desired ends. The systems of innovation literature, pioneered by Freeman (1995), Lundvall (1992) and Nelson (1993), is especially relevant here. There is increasing reliance on such horizontal systems of diffusion as we move to open innovation systems where barriers between public and private collaboration are reduced. For years we have known that innovation is not just a result of R& D spending, but about the set of institutions that allow new knowledge to diffuse throughout the economy. Dynamic science– industry links are one way that innovation gets supported, but the examples in my book The Entrepreneurial State the have shown that the ‘links’ can go much deeper, and extend back decades. It becomes much more difficult to continue to visualize the innovation process as one occurring through separate and isolated activities of the State and the firm. But rather than introducing new trendy words, like ecosystems of innovation to describe the innovative process, it is now more important than ever to understand the division of ‘innovative’ labour between the different actors in these systems, and in particular, the role and commitment of each actor in the context of the very bumpy risk landscape within which they are operating. While the State needs to take risks, it should not be simply absorbing (or even ‘mitigating’) the risk of the private sector, but taking the kind of risks that the private sector is not willing to take, and also reaping returns from that risk taking. Reaping the returns is crucial, because the innovation cycle can thus be sustained over time (with returns from the current round funding the next round— as well as the inevitable losses along the way) and be less susceptible to political and business cycles. Public policies should focus on the specific role the public sector plays, within and between sectors and institutions, in order to allow things to happen that otherwise would not have— exactly as Keynes argued in The End of Laissez Faire (1926). This is not only about the important countercyclical role that public sector spending should have (and unfortunately is not having today due to the austerity ideology), but also about the types of questions that must be posed to each individual policy instrument: e.g. do R& D tax credits make R& D happen that would otherwise not have? It is precisely due to its different character (from business) that the State cannot have an ‘exact’ and ‘limited’ role in innovation (a sort of balancing point). Accepting this difference means that we need a way to understand both the State’s specific area of influence and the specific performance indicators that are needed to judge its activities. 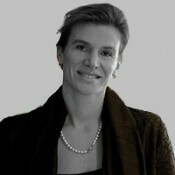 For example, while funding for the Concorde aeroplane (the usual example that is used to accuse the government of ‘picking winners’) can be seen as failure, a real understanding of the State’s performance in that enterprise should go beyond a simplistic cost-benefit analysis and take into account the full spillovers— tangible and intangible— that the investments in Concorde entailed. Has this ever been done? No, and yet it seems that everyone is in broad agreement that it was a massive failure. Furthermore, investments by the State need to be appraised as an inter-temporal, long-term portfolio. Again, this is something yet to be done (and indeed part of my ongoing research projects). What distinguishes the State is of course not only its mission but also the different tools and means that it has to deploy the mission. In Karl Polanyi’s epic book The Great Transformation (1944), he argued the State created— pushing, not only nudging— the most ‘capitalist’ of all markets, the ‘national market’ (while local and international ones have pre-dated capitalism). The capitalist economy will always be subordinate to the State and subject to its changes. Thus rather than relying on the false dream that ‘markets’ will run the world optimally for us ‘if we just leave them alone’, policymakers must better learn how to efficiently use the tools and means to shape and create markets— making things happen that otherwise would not. And making sure those things are things we need. Increasingly this requires growth to be not only ‘smart’ but also ‘inclusive’ and ‘sustainable’. It is of course important not to romanticize the State’s difference and its ability. The State fearing ‘nukes’ from the USSR, the sinking of Florida or running out of oil may cause it to do what no one else can— e.g. use its ability to create money and risk wasting it on an inane idea/ solution, such as war. On the other hand, the State can do this by leveraging a massive national social network of knowledge and business acumen— all with the knowledge that no matter what, tax dollars will keep coming in because, ultimately, the State is an active compulsory force in our lives— which we need, however, to make sure will be controlled with our just, fragmented government structures and election processes. As Stirling (2014) has recently put it: ‘The more demanding the innovation challenges like poverty, ill health, or environmental damage, the greater becomes the importance of effective policy. This is not a question of “picking winners”— an uncertainty-shrouded dilemma which is anyhow equally shared between public, private, and third sectors. Instead, it is about engaging widely across society in order to build the most fruitful conditions for deciding what “winning” even means’. To rely solely and strictly on Keynes is to accept that the role of the State, in balancing accounts, might as well fund a useless search for banknotes in an abandoned coal mine. Following the wisdom of Steve Jobs, mentioned earlier, it is the State that should ‘stay foolish’ in its pursuit of technological development and social problem solving. Whether the State is making an investment in the Internet or clean energy in the name of national security (having imagined a new ‘threat’) or in the name of climate change (or just as often ‘energy independence’), it can do so on a scale and with tools not available to businesses (i.e. taxation, regulation). If a central hurdle to business investment in new technology is that it will not make investments that can create benefits for the ‘public good’ (since it then can’t capture the majority of the value created), then it is essential the State do so— and worry about how to transform those investments into new economic growth later. ‘Foolish’ businesses will not survive, as they all must take calculated risks related to product development and entry into new markets. Apple’s success did not hinge on its ability to create novel technologies; it hinged on its designing, operational and organizational capabilities in integrating, marketing and selling those low-hanging technologies. In contrast, the flexibility of the State is an important asset, which should be allowed to make its ‘foolish’ investments in technology in a targeted and purposeful manner. Who would ever have guessed that technology created to preserve communication abilities during a nuclear war would become the world’s go-to platform for knowledge, communication and commerce? How many back then thought the Internet was a ‘foolish’ way to invest millions in taxpayer dollars? What is needed today is a ‘systems’ perspective, but one that is more realistic on the actual— rather than mythological— role of the individual actors, and the linkages between actors, within and along the risk landscape. It must also bridge, as stated earlier, the knowledge gap that exists to explain how State investments catalyse, influence and connect to the growth of business organizations on which we rely, ultimately, to deliver new technologies on a broad scale. It is, for example, unrealistic to think that the highly capital-intensive and high-risk areas in clean technology will be ‘led’ by venture capital, or ‘nudged’ by a small and unstructured green investment bank. In the case of clean energy, it’s also not just about the willingness of the State to lead, but the willingness to sustain support for new and transitional technologies until industry can ‘mature’— until the cost and performance meet or exceed those of incumbent technologies (e.g. fossil power). The history of new sectors teaches us that private investments tend to wait for the early high-risk investments to be made first by the State. Indeed, it has often been State spending that has absorbed most of the real risk and uncertainty in the emergence of new sectors, as well as in particular areas of old sectors (e.g. radical new medicines today). Yet the returns from these ‘revolutionary’ State investments have been almost totally privatized. While this is especially obvious in the pharmaceutical industry, where medicines that are funded from taxpayer money are often too expensive for the taxpayers to buy , it is also true in other high-tech areas, with companies like Apple, which have received major benefits from public funds, both direct and indirect, managing to avoid paying their taxes. Three key implications arise from this analysis. First, it is of course not enough to talk about the ‘entrepreneurial State’; one must build it— paying attention to concrete institutions and organizations in government that are able to create long-run growth strategies and ‘welcome’ the inevitable failure that this will entail. Indeed, it is not a coincidence that the weakest countries in the Eurozone are precisely those that have low spending in areas that seem costly today, but which bring growth in the future: areas like R& D and human capital formation. Yet we are told they are countries that spent too much. And while ‘governance’ is often used as a reason to impose market reforms, in reality governance should also be about how to bring expertise together and create willingness to invest in high-growth, high-risk areas. As anyone who has worked in the private sector knows, there are plenty of ‘bureaucratic’ and inertial businesses. There is nothing in the DNA of the public sector that makes it less innovative than the private sector. But equally, encouraging innovation and creativity in public sector institutions requires thinking about organizational dynamics. Instead, by dismissing the ability of the public sector to be an innovative force from within, most thinkers about strategic management and organizational change have focused more on the private sector, leaving the public sector to simply focus on ‘creating the conditions’ for innovation to happen in the ‘revolutionary’ private sector. And, as discussed above, this has created a self-fulfilling prophecy, where the smartest young graduates think that it will be more exciting and fun to work at Goldman Sachs or Google rather than a State investment bank or a ministry for innovation. The only way to rebalance this problem is to upgrade, not downgrade, the status of government— and the words and the images used to describe it. There are important implications for the Eurozone crisis. The conditions being imposed on the weakest countries, via the ‘fiscal compact’, should be conditions not about reducing the public sector across the board, but conditions that increase the incentives for governments to spend on key areas like education and R& D, and also to transform the public sector from within so that it is more strategic, meritocratic and dynamic. While this might sound difficult, it is no less difficult than imposing the austerity that is undermining the weaker countries’ socioeconomic structure and future competitiveness. Second, if the State is being asked to engage in the world of uncertainty, with the inevitable wins and losses (which also characterize private venture capital), then it is only right that when the wins arrive (the upside) there is also a return to cover the losses (the downside). That is, while the State should not expect a financial return for its spending on public goods like education and healthcare, the State’s high-risk investments should be thought of differently, and allowed to reap a direct return precisely because the failure rate is so high. Successful ‘winning’ State investments should be able to cash in so as to cover losses when they arise, as well as fund the investments of the future— still unpredictable today. While the privatization of gains and socialization of losses in the financial sector have been recognized as economically inefficient and socially unjust, the same asymmetry that occurs in the real economy, both for new-technology firms and for more mature firms that need external investment in turnaround, has remained unnoticed. A clearer risk– reward relationship will not only increase government revenue— during a time in which public sector budgets are under strain— but also allow taxpayers to see a clearer reward from their investments and hence help increase the political support needed for making investments that lead to long-run future growth. Third, by focusing on the role that the State plays along the bumpy risk landscape, acting actively and courageously rather than just ‘de-risking’ the private sector and correcting ‘market failures’, the analysis provided here has the potential to better inform policies that are directed towards other actors in the ‘ecosystem’ of innovation. This is important because, as outlined earlier, part and parcel of undermining the role of the State has been the ‘hyping’ up of the role of other actors— from SMEs to venture capital and shareholders. Thus, acknowledging the different roles played in the ecosystem— over time and along the bumpy risk landscape— will make it more difficult for overhyped economic actors that have captured the public imagination to argue for handouts and subsidies. The Appendix contains a list of government savings (using the UK as an example) that could arise by approaching the ‘ecosystem’ in a more realistic way— with policies based on what we know about the different actors, rather than the associated myths. We live in an era in which the State is being cut back. Public services are being outsourced, State budgets are being slashed and fear rather than courage is determining many national strategies. Much of this change is being done in the name of rendering markets more competitive, more dynamic. The Entrepreneurial State is an open call to change the way we talk about the State, its role in the economy and the images and ideas we use to describe that role. Only then can we begin to build the kind of society we want to live in, and want our children to live in, in a manner that pushes aside false myths about the State and recognizes how it can, when mission driven and organized in a dynamic way, solve problems as complex as putting a man on the moon and solving climate change. And we need the courage to insist— through both vision and specific policy instruments— that the growth that ensues from the underlying investments be not only ‘smart’, but also ‘inclusive’. 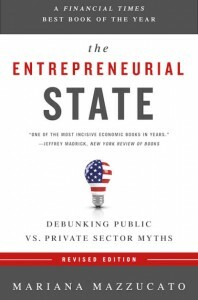 This piece was adapted from the The Entrepreneurial State: Debunking Public vs. 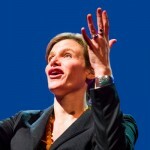 Private Sector by Mariana Mazzucato.